PLC staff joined IHAO on a delivery to the western part of Mosul. Day by day neighborhoods were being freed from ISIS control, and sights and sounds of fighting were all around. 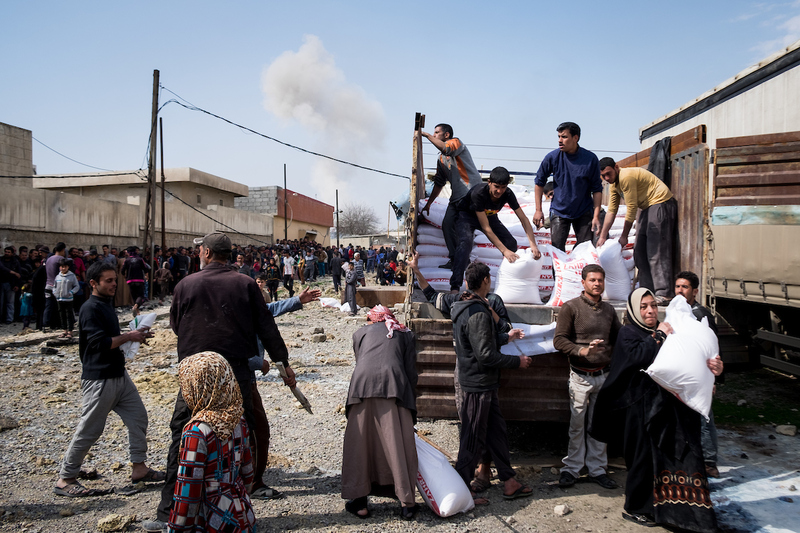 Many people were desperate to receive food after more than two years being cut off from aid. The other day, news broke that up to 200 people were killed in a U.S. airstrike in west Mosul. This was not an isolated incident. There have been over 800 alleged civilian deaths from U.S.-led airstrikes in Iraq this month alone. The people of west Mosul are trapped in the middle of a war in which their humanity seems to count for very little. To ISIS, they are leverage. The militants are all too happy to use them them as human shields, moving them from one neighborhood to another, putting innocent families in between themselves and the advancing Iraqi army. To coalition forces, they’re a PR problem—unfortunate yet mostly inconvenient collateral damage, impeding their quest to retake the city. We know who Mosul is being liberated from. But who is Mosul being liberating for? There will, no doubt, be investigations. Official explanations will be offered, assurances that every effort is being made to protect civilian lives. But the fact remains that hundreds are being killed. And so far, at least, there are no plans to change the way airstrikes are carried out. The awful thing is that we know… this will never work. We cannot bomb our way to peace. When the airstrikes stop and all the bodies are finally pulled from the rubble, Mosul will be left with destruction, not harmony. In this conflict, we can’t even bomb our way to victory, because each airstrike that takes innocent human life or blasts a hole in someone’s home in Iraq or in Syria simply plants the seeds of future extremism. These tactics alienate the very people who are being “liberated.” Every time more civilians are killed, it gives further weight to the idea that we have lowered value of human life—or at least, the value placed on Iraqi lives. Imagine the response, by comparison, if 200 American aid workers were killed in an errant strike. The seemingly low threshold for civilian safety makes the fight against ISIS harder, not easier. It makes ISIS propaganda more believable. At the very moment when ISIS should be gasping its final breath, these incidents inject life into their militancy. These contested airstrikes also make it harder for groups like ours to go to the frontlines, precisely when we’re needed most. Due to investigations into the circumstances surrounding the airstrike on March 17, security protocols have been tightened, and access restricted. And as a result, families who are literally caught in the crossfire suffer even more. ISIS was born out of violence. But death and destruction—they are no solution to death and destruction. Regardless of why there’s been a marked increased in civilian casualties caused by coalition forces in Iraq and Syria—whether or not the rules of engagement have been relaxed in recent months, as some have alleged—it is unacceptable. Failure to take extraordinary caution to avoid civilian casualties strips vulnerable people of their humanity. It is a tragic loss of life, and it sets the world up for future conflicts just like this one. We cannot bomb our way to peace. We cannot claim victory in a war if we start another one—and another one, and another—in the process. We cannot help people regain their humanity by disregarding it ourselves. The road to peace is paved with sacrificial love. It requires valuing the lives of those in Mosul as much as we value our own… and then acting like it. That is why we go to the hard places. It’s not just about providing food or water or medical care. It’s about seeing people—their full humanity, their full worth. Every one of those lives lost in the March 17 airstrike was sacred. Thank you for seeing that. Thank you for seeing the full humanity of our friends in Mosul—for loving them, even when almost no one else does. Please continue to show up with us on the front lines, armed not with bombs and ammunition, but with emergency aid—most importantly—love. Keep showing up in Mosul to let people know they are seen, loved, and valued. Ben Irwin contributed to this story.